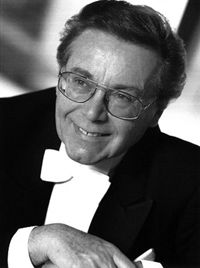 Peter Schreier is one of the most illustrious lyric tenors of the 20th century. Born in 1935 in Saxony, he began his music studies with the celebrated Dresden Kreuzchor, where he spent nine years as a choirboy. He went on to study singing, orchestral and choral conducting at the Dresden Music Academy. In the early 1960s, he held positions at the Dresden and Berlin State Operas, followed a few years later by débuts at the Vienna State Opera, the Metropolitan Opera in New York and the Salzburg Music Festival. He became famous particularly as a Mozart tenor, a Lied singer and the Evangelist role in the Bach Passions. He has recorded the core Lied repertoire and the major oratorio and opera roles for lyric tenor. Since 1979, Schreier has also appeared as a conductor with numerous distinguished orchestras in Europe and the USA. In 1988, he received the renowned 'Ernst von Siemens Musikpreis' in Munich for his performances of Mozart operas.